Throughout history, many natural events have had a profound effect on mankind, but few such events have shaped history and culture as completely and profoundly as the Black Death. In this vast tragedy a mere bacillus, Yersinia pestis, terrorized all of Europe, killing one third of the population in its path, and ultimately brought about social and cultural changes that impacted on art, literature, religion and philosophy. The Black Death is believed to have erupted in the Gobi Desert in the late 1320s, having lain dormant in the preceding centuries. From there the bacillus spread outward in almost every direction. In particular, it moved west along caravan routes and by ship. 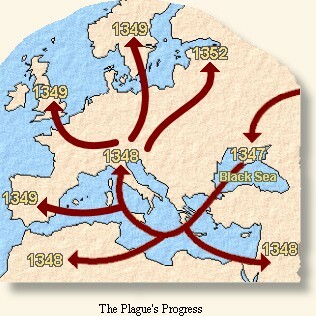 Indeed, to a large extent, the progress of the plague followed the geography of medieval trade. By 1345 the plague hit the lower Volga River; by 1346 it entered the Caucasus and the Crimea; by 1347 it was in Constantinople, Alexandria and Sicily. 1348 saw the bacillus spread to France and Germany. Norway was hit in 1349; the eastern European countries were hit in 1350, and Russia in 1352. Nor was Europe the only region affected. In China, for example, the population dropped from around 125 million to 90 million as a result. Yersinia pestis is a bacillus, usually carried by fleas. These fleas infest rats and other rodents as well as human hosts living in rat-infested areas. Infected individuals usually have high fevers, aching limbs and often vomit up blood. Most characteristic is a swelling of the lymph nodes in the neck, armpits and groin known as a “buboe”. The clinical progression of the disease from the first symptoms of fever and aches to agonizing death usually takes only three or four days. Streptomycin is the current drug treatment of choice, an important point considering that Yersinia pestis has not yet been eradicated. (As recently as 1898 an outbreak in India took six million souls.) Without treatment, the speed with which the disease can kill is especially terrifying. The Italian author Boccaccio wryly noted that the plague victims "ate lunch with their friends and dinner with their ancestors in paradise." Yersinia pestis can be transmitted in three different ways, and the clinical manifestations that appear depend on the route of transmission. In bubonic plague the organism is spread by infection from rat fleas. Pneumonic plague results when one person spreads the bacterium to another individual via of droplets in the air. Septicemic plague is the third type, and occurs when the bacterium enters into the bloodstream of the victim. As a result of the plague about one-third of Europe perished. Certain professions suffered even higher mortality, especially the doctors and the clergy caring for the sick. Peasants fled their fields, leaving livestock to fend for themselves. Crops were left to rot. Chaos ran amuck both in cities and in the countryside. The peasant class benefited from the plague (at least those that survived) as a result of improved employment opportunities and higher wages. Peasants traveled about to obtain work where they could best command a good wage; as a result, society became more mobile, and peasants enjoyed a higher standard of living. (The improvement in the living standard for many peasant families is evidenced by archeological findings suggesting a shift from earthenware to metal cooking pots at that time). With the fall in population many landowners were not getting the rental income they needed, and were forced to sell their land. This redistribution of land ownership necessarily influenced the distribution of social and political authority, these being intimately tied to land ownership. Cities were especially affected. Construction projects stopped. Guilds lost their craftsmen. A severe labor shortage developed, with the consequence that wages rose. Financial businesses were disrupted as debtors died and their creditors went unpaid. Whole families died, leaving their houses standing empty. The cause of the disease was a matter of considerable concern to everyone. Popular opinion saw the plague as a scourge from God, but the learned intelligentsia of the time thought they knew better. Medical experts in Paris studied the problem at the request of Pope Clement VI. They maintained that this catastrophe was actually the result of a fateful conjunction of Saturn, Jupiter and Mars in the sign of Aquarius. Not surprisingly, many people believed that the horrors they witnessed signaled the Apocalypse. Others believed that the disease was a plot by Jews to poison the Christian world. The result that many Jews were killed by unruly mobs. There were massacres, especially in the cities along the Rhine, and many more cases of Jews being expelled from cities and towns. These actions became so common that the Pope issued Papal edicts in the summer of 1348 forbidding the slaughter of Jews; regrettably, this action was largely ineffective. Still, the plague as an expression of divine fury theory dominated much of public opinion. From this thought came the flagellants: bands of citizens who wandered about the countryside doing penance to atone for the evil of the world, sometimes also killing any Jews they encountered as a special offering to God. The flagellants scourged themselves with whips of hard knotted leather containing little iron spikes. In 1349 Pope Clement VI condemned them and ordered authorities to suppress them, but given the chaos of the time these actions were far from effective. The cultural impact of the plague was enormous. Universities, often located in the more urban areas, were severely affected, and were closed or even abandoned, as professors and students died in large numbers. Similarly, educated individuals such as priests and physicians, died in mass. Without priests, no one could hear confession. Without bishops, no one could ordain new priests. Worse, people began to doubt God, asking, “Why would a just and merciful God do this? Why would God so scourge the world?” Such questions set the stage for religious doubt, and ultimately led to a reduction in the influence of the church in matters of everyday life. Despair reigned throughout Europe, and faith in God ebbed. Many survivors of the plague were particularly disillusioned by the church's inability to explain the reason for the plague or deal with the outbreak. The mood of despair soon influenced the art and writings of the time. 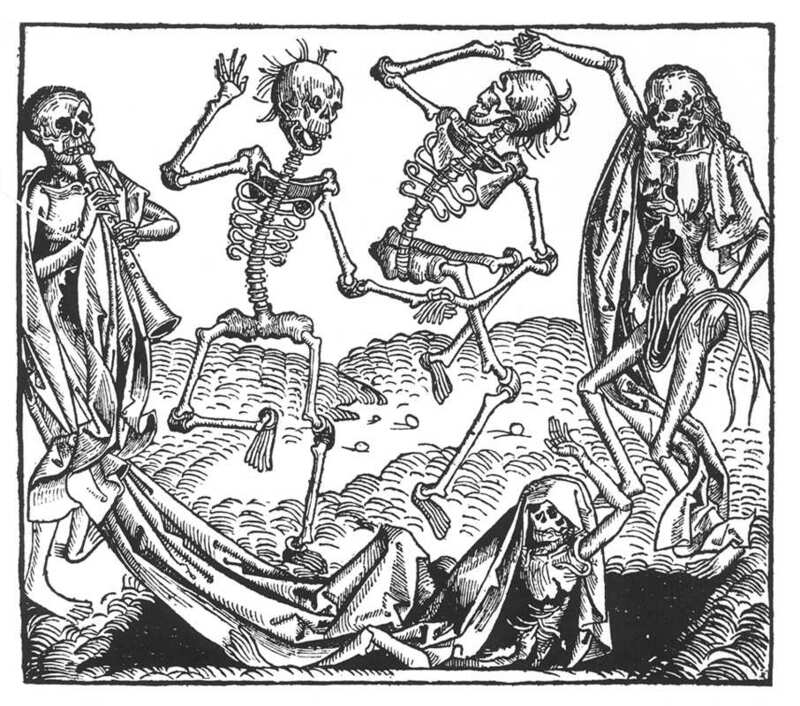 For instance, artistic styles frequently took on a grim and macabre tone, as illustrated in the famous Dance of Death motif showing skeletons dancing together or sometimes mingling with living men in scenes of daily life. in men and women alike there appeared, at the beginning of the malady, certain swellings, either on the groin or under the armpits, whereof some waxed to the bigness of a common apple, others to the size of an egg, some more and some less, and these the vulgar named plague-boils. 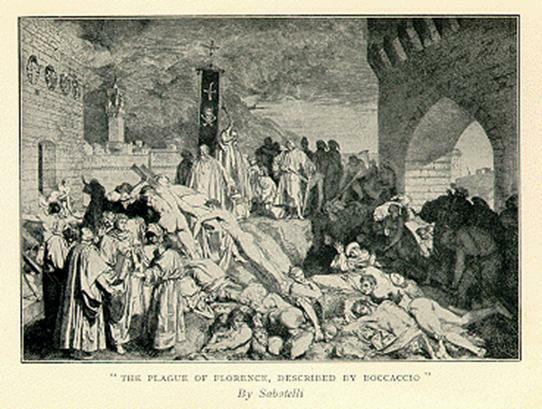 Boccaccio’s graphic verbal depictions of the plague influenced artists for many decades to come, as in the depiction of the plague in Florence shown below by Luigi Sabatelli (1772 – 1850). To some historians the Black Death serves as an important dividing point between the central and the late Middle Ages, a historical division that underscores numerous changes in culture, technology and religion. As discussed above, these changes were to a considerable extent a consequence of the plague itself, with its tragic path of death and bereavement leading to demographic and economic calamity, political dislocation, and with the genesis of important new trends in culture and religion. Before the time of the plague the church had a profound and sustained influence on the populace, who, more often than not, were quite receptive to its teachings. In addition, the Pope had become extremely powerful while the church had become a both a great temporal power as well as an influential spiritual force. With the advent of the plague the character of the time changed to one of crisis and trouble, and life was more bleak and uninviting than ever. The plague and its devastation lead a good deal of questioning in the minds of many people, who started to question the value of many religious observances, of prayer, and of pilgrimages. Some scholars theorize that the death of so many clerics, scholars and teachers resulted in universities largely abandoning the teaching of Latin, with the result that local dialects often replaced Latin as the official language of law and scholarship, and ultimately created the conditions that allowed the various Protestant religions to flourish. In addition, the practical necessity of letting large amounts of 'new blood' into established institutions such as law and medicine (to ensure their survival in the face of a tremendous loss of personnel) brought new approaches to thinking that could not easily be suppressed by those in authority. Few events in history have had the social and cultural impact as the Black Death, a pandemic that killed one third of Europe in the seven-year period 1345 to 1352. The resulting deaths resulted in severe labour shortages among the peasants, the clergy and the intelligentsia. The result was profound social and cultural changes that impacted on art, literature, religion and philosophy. In particular, as despair reigned throughout Europe, faith in God ebbed, and the influence of the church waned. Anonymous. The Black Death, 1348. http://www.ibiscom.com. (Boise State University. Last Revised 17 August 1995. Norman Cantor. Civilization of the Middle Ages. New York: Harper Collins. 1993. Norman Cantor. In the Wake of the Plague: The Black Death and the World It Made. Free Press. 2001.